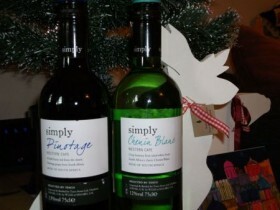 This year I have found 2 little gems for you at a price that means you can have a festive Christmas. They are the Tesco range of Simply Wines and the 2 I have found we like the most, first are the Pinotage from the South Western Cape, it is bold, full of fruit and a soft warmth just what you need it on a wintry evening. The second wine is Chenin Blanc again from the Simply range and again from the Western Cape, a lemon zest vibrant wine which will make easy drinking with a stir fry or buffet supper using up the left over Turkey and Ham both come in at under £4 well to exact £3.99, these are not the wines I am saying have with your Christmas lunch but these wines offer terrific value for over the Christmas period, have a very happy Christmas.